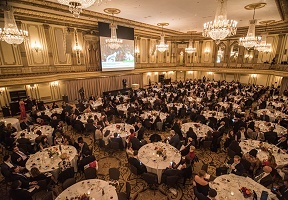 In May, generous supporters gathered together at the Palmer House Hilton to celebrate the work of Youth Guidance (YG) and the formative journey of its youth during the 2018 Bright Futures Gala. The night’s events raised much needed funds that will further support school-based programs that now support 11,000 youth. The programs include Becoming A Man® (BAM), Working On Womanhood℠ (WOW), Parent and Family Engagement, Project Prepare®, and Extended Day & Enrichment programs. Special guests attending the night’s festivities were Mayor Rahm Emanuel, business executives, Cook County President Toni Preckwinkle, community leaders, and Gala Co-chairs Paul C. and Diane H. Reilly, and Douglas K. Walker. One of the evening’s most inspirational moments was when a young WOW participant shared her personal journey of challenges and overcoming obstacles with the help of the evidence-based program. Both BAM and WOW help youth channel their negative energy into positive solutions. Youth Guidance prides itself on meeting youth where they are – physically within schools, socially and emotionally – to help them overcome obstacles and focus on their education. The funds raised will support the organization’s mission and expansion of providing counseling, mentoring and afterschool supports to youth from under-resourced communities in need all across Chicago. 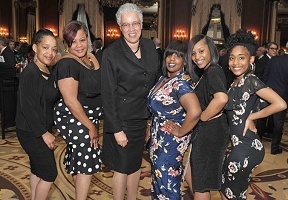 Caption: Pictured left to right: Sophie LaCur, Cora Washington, Cook County Commissioner Toni Preckwinkle, WOW Counselor Alicia Jones, and WOW students Phillis and Brianna.